We all know how difficult it can be to get ourselves out there doing what we are meant to be doing. We have blocks and layers and brick walls we keep running our heads into, know what I mean? These are forms of energy. Different kinds of energy, but still energy. And energy can be transformed, transmuted or just plain released back into pure form. Now I know not everyone knows how to work with energy or understands its principles...I certainly don’t. But one thing I do know is that I can and do affect it. So I’m offering my services to you Light Workers who need a little more help getting out there. Because right now we are ALL needed to step up and do our thing. The people who need us are waiting for our light. And my thing is helping you step up and do your thing. I'm not saying it’ll fix everything and you’ll be on stage tomorrow, but I can release what’s ready and waiting to be released right now so that you can get to your next level more easily. Those blocks and walls...and layers. As many as your system can handle releasing in a single session. Gone. Ones I’ve done recently have had between 6 and 32 trapped emotions blocking the way. Clears a bunch like that in one session depending on how much your energy system can handle. Since I don’t know how many or how long it will take for your treatment, I do these by email. So you’ll get a report from me indicating what frequencies were blocked and what emotions or walls were blocking them. If you are ready and willing to accept assistance on your path in this method, this way, this Light Worker Frequency Healing Treatment Session may be for you. 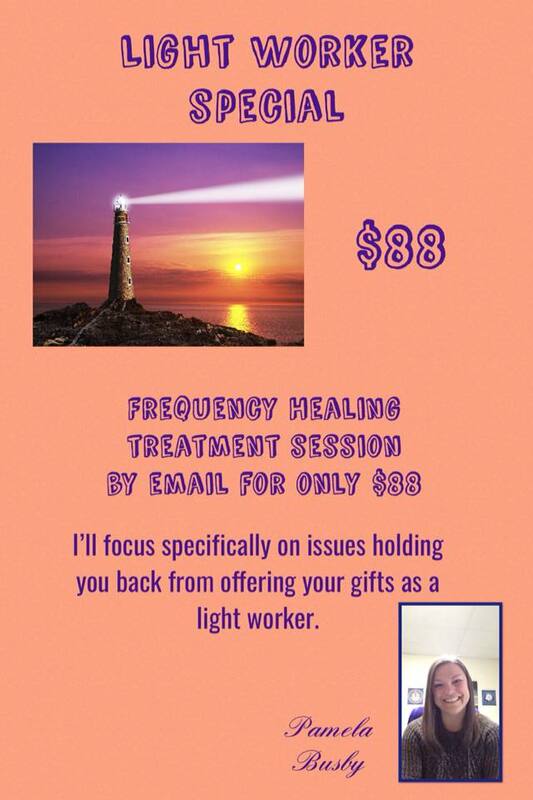 And I’m offering a discount right now at $88 instead of $144 for a limited time only...just for you as a Light Worker! Please include your email address with your request, so I know where to send your Treatment Report! You know you are meant to shine...so what’s in YOUR way?